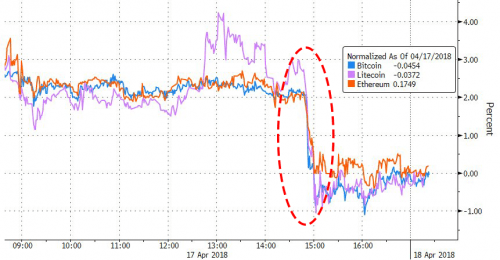 As there was no immediate news or catalyst, some attributed the sale to Tuesday’s report that New York Attorney General Eric Schneiderman had launched an investigation into 13 cryptocurrency exchanges including Coinbase, Gemini and Bit Trust. The probe seeks information on fees, volume data and procedures governing margin trading among other things. However, the news hit some 4 hours prior to the sale. As we have documented in the past, previous selloffs have also been attributed to single-user selling – with the most famous case being a March 7 “Mt. Gox” sale, first reported here, when trustees of the insolvent exchange announced the liquidation of over $400 million in Bitcoin and Bitcoin Cash. ← Time to get off the Trump train: Donald ((Judas)) Trump! – The only option for Whites is: REVOLUTION!